Monotremes are highly specialized feeders on invertebrate prey, but the diets and foraging behaviors of the living species are all very different. The short-beaked echidna specializes in feeding on ants, an abundant food resource exploited by relatively few other Australian animals, which is another reason for the species' great success. The echidna's long narrow snout or "beak" is thought to be equipped with an additional sense that enables the animal to detect electrical activity, but probably the most important sense when it comes to feeding is smell. The echidna shoves its snout into ant nests and rotten logs. If ants are detected, the animal uses its claws to rip open the nest and begins lapping up the insects with its long, sticky tongue. Mouthfuls of ants are mashed between the tongue and the hard palette of the echidna's mouth before being swallowed. hard palate, while smaller ones are strained out of the water or sediment. The food is then pushed into large cheek pouches and stored while the platypus searches for more. 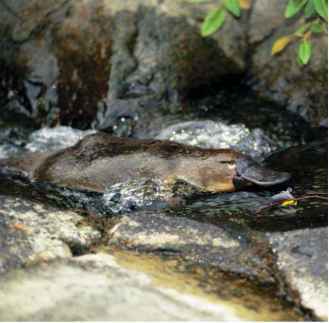 The platypus returns to the surface periodically to process and eat its catch. 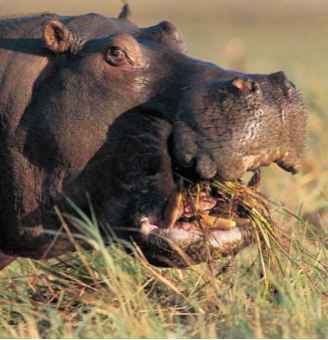 Food is crushed and ground between horny plates that line each jaw, and swallowed. It may take several minutes to finish such a meal, during which time the platypus drifts at the surface with its feet spread wide. The third species, the long-beaked echidna of New Guinea, is though to feed mainly on earthworms, which it unearths in humid forests. Its extra long nose is used to probe deep into the humus layer or into the topsoil, and once detected, prey is quickly excavated with the front feet, collected with the aid of a long, mobile tongue that is armed with hooklike spines in a central groove. The worms are lightly mashed in the mouth, then swallowed.